The Business Plot was an alleged political conspiracy in 1933 in the United States. Retired Marine Corps Major General Smedley Butler claimed that wealthy businessmen were plotting to create a fascist veterans' organization with Butler as its leader and use it in a coup d'état to overthrow President Franklin D. Roosevelt. In 1934, Butler testified before the United States House of Representatives Special Committee on Un-American Activities (the "McCormack-Dickstein Committee") on these claims. No one was prosecuted. On July 17, 1932, thousands of World War I veterans converged on Washington, D.C., set up tent camps, and demanded immediate payment of bonuses due to them according to the World War Adjusted Compensation Act of 1924 (the original act made the bonuses initially due no earlier than 1925 and no later than 1945). Walter W. Waters, a former Army sergeant, led this "Bonus Army". 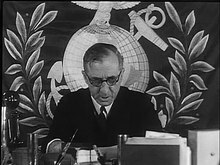 The Bonus Army was encouraged by an appearance from retired Marine Corps Maj. Gen. Smedley Butler; as a popular military figure of the time, Butler had some influence over the veterans. 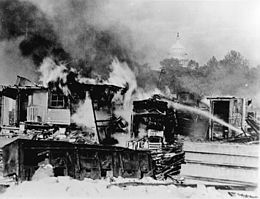 A few days after Butler's arrival, President Herbert Hoover ordered the marchers removed and U.S. Army cavalry troops under the command of Gen. Douglas MacArthur destroyed their camps. Butler, although a self-described Republican, responded by supporting Franklin D. Roosevelt in the 1932 US presidential election. By 1933 Butler started denouncing capitalism and bankers, going on to explain that for 33 years he had been a "high-class muscle man" for Wall Street, the bankers and big business, labeling himself as a "racketeer for Capitalism." Roosevelt's election was upsetting for many conservative businessmen of the time, as his "campaign promise that the government would provide jobs for all the unemployed had the perverse effect of creating a new wave of unemployment by businessmen frightened by fears of socialism and reckless government spending." Some writers have said concerns over the gold standard were also involved; Jules Archer, in The Plot to Seize the White House, wrote that with the end of the gold standard, "conservative financiers were horrified. They viewed a currency not solidly backed by gold as inflationary, undermining both private and business fortunes and leading to national bankruptcy. Roosevelt was damned as a socialist or Communist out to destroy private enterprise by sapping the gold backing of wealth in order to subsidize the poor." The Committee began examining evidence on November 20, 1934. On November 24 the committee released a statement detailing the testimony it had heard about the plot and its preliminary findings. On February 15, 1935, the committee submitted its final report to the House of Representatives. During the McCormack–Dickstein Committee hearings Butler testified that Gerald C. MacGuire attempted to recruit him to lead a coup, promising him an army of 500,000 men for a march on Washington, DC, and financial backing. Butler testified that the pretext for the coup would be that the president's health was failing. Despite Butler's support for Roosevelt in the election and his reputation as a strong critic of capitalism, Butler said the plotters felt his good reputation and popularity were vital in attracting support amongst the general public and saw him as easier to manipulate than others. Given a successful coup, Butler said that the plan was for him to have held near-absolute power in the newly created position of "Secretary of General Affairs", while Roosevelt would have assumed a figurehead role. Those implicated in the plot by Butler all denied any involvement. MacGuire was the only figure identified by Butler who testified before the committee. Others Butler accused were not called to appear to testify because the "committee has had no evidence before it that would in the slightest degree warrant calling before it such men ... The committee will not take cognizance of names brought into testimony which constitute mere hearsay." On the final day of the committee, January 29, 1935, John L. Spivak published the first of two articles in the communist magazine New Masses, revealing portions of the Congressional committee testimony that had been redacted as hearsay. Spivak argued that the plot was part of a plan by J.P. Morgan and other financiers, some of whom were Jewish, who were coordinating with fascist groups to overthrow President Franklin D. Roosevelt. Roosevelt was seen by some far rightists (such as Elizabeth Dilling) as a communist agent. Hans Schmidt concludes that while Spivak made a cogent argument for taking the suppressed testimony seriously, he embellished his article with his "overblown" claims regarding Jewish financiers, which Schmidt dismisses as guilt by association not supported by the evidence of the Butler-MacGuire conversations themselves. On March 25, 1935, MacGuire died in a hospital in New Haven, Connecticut, at the age of 37. His attending doctor at the hospital attributed the death to pneumonia and its complications, but also said that the accusations against MacGuire had led to his weakened condition and collapse which in turn led to the pneumonia. Smedley Butler describes the alleged plot in 1933. Around August 1, MacGuire visited Butler alone. Butler stated that MacGuire told him Grayson Murphy underwrote the formation of the American Legion in New York and Butler told MacGuire that the American Legion was "nothing but a strikebreaking outfit." Butler never saw Doyle again. On September 24, MacGuire visited Butler's hotel room in Newark. In late September Butler met with Robert Sterling Clark. Clark was an art collector and an heir to the Singer Corporation fortune. MacGuire had known Robert S. Clark when he was a second lieutenant in China during the Boxer Rebellion. Clark had been nicknamed "the millionaire lieutenant". On August 22, Butler met MacGuire at a hotel, the last time Butler met him. According to Butler's account, it was on this occasion that MacGuire asked Butler to run a new veterans' organization and lead a coup attempt against the President. On November 20 the Committee began examining evidence. Journalist Paul Comly French broke the story in the Philadelphia Record and New York Post on November 21. On November 22, The New York Times wrote its first article on the story and described it as a "gigantic hoax". A The New York Times editorial dismissed Butler's story as "a gigantic hoax" and a "bald and unconvincing narrative." Thomas W. Lamont of J.P. Morgan called it "perfect moonshine". Gen. Douglas MacArthur, alleged to be the back-up leader of the putsch if Butler declined, referred to it as "the best laugh story of the year." Time magazine and other publications also scoffed at the allegations. When the committee released its report, editorials remained skeptical. Time wrote: "Also last week the House Committee on Un-American Activities purported to report that a two-month investigation had convinced it that General Butler's story of a Fascist march on Washington was alarmingly true." The New York Times reported that the committee "alleged that definite proof had been found that the much publicized Fascist march on Washington, which was to have been led by Maj. Gen. Smedley D. Butler, retired, according to testimony at a hearing, was actually contemplated." Separately, Veterans of Foreign Wars commander James E. Van Zandt stated to the press, "Less than two months" after Gen. Butler warned him, "he had been approached by 'agents of Wall Street' to lead a Fascist dictatorship in the United States under the guise of a 'Veterans Organization'." Robert F. Burk wrote, "At their core, the accusations probably consisted of a mixture of actual attempts at influence peddling by a small core of financiers with ties to veterans organizations and the self-serving accusations of Butler against the enemies of his pacifist and populist causes." Hans Schmidt wrote, "Even if Butler was telling the truth, as there seems little reason to doubt, there remains the unfathomable problem of MacGuire's motives and veracity. He may have been working both ends against the middle, as Butler at one point suspected. In any case, MacGuire emerged from the HUAC hearings as an inconsequential trickster whose base dealings could not possibly be taken alone as verifying such a momentous undertaking. If he was acting as an intermediary in a genuine probe, or as agent provocateur sent to fool Butler, his employers were at least clever enough to keep their distance and see to it that he self-destructed on the witness stand." ^ a b c "Credulity Unlimited". The New York Times. November 22, 1934. ^ a b Schmidt, p. 219 "Declaring himself a "Hoover-for-Ex-President Republican," Smedley used the bonus issue and the army's use of gas in routing the "Bonus Expeditionary Force"--recalling infamous gas warfare during the Great War--to disparage Hoover during the 1932 general elections. He came out for the Democrats "despite the fact that my family for generations has been Republican," and shared the platform when Republican Sen. George W. Norris opened a coast-to-coast stump for FDR in Philadelphia....Butler was pleased with the election results that saw Hoover defeated; although he admitted that he had exerted himself in the campaign more "to get rid of Hoover than to put in Roosevelt," and to "square a debt." FDR, his old Haiti ally, was a "nice fellow" and might make a good president, but Smedley did not expect much influence in the new administration." ^ G.C. M'Guire Dies; Accused of 'Plot', The New York Times (March 26, 1935) (subscription). An image of the article is also accessible down the page here. Retrieved July 27, 2017. ^ a b c d Schmidt, Hans (1998). Maverick Marine (reprint, illustrated ed.). University Press of Kentucky. p. 224. ISBN 0-8131-0957-4. Spivak, John L. (Jan–Feb 1935). "Wall Street's Fascist Conspiracy: Testimony that the Dickstein MacCormack Committee Suppressed; Wall Street's Fascist Conspiracy: Morgan Pulls the Strings" (PDF). New Masses.